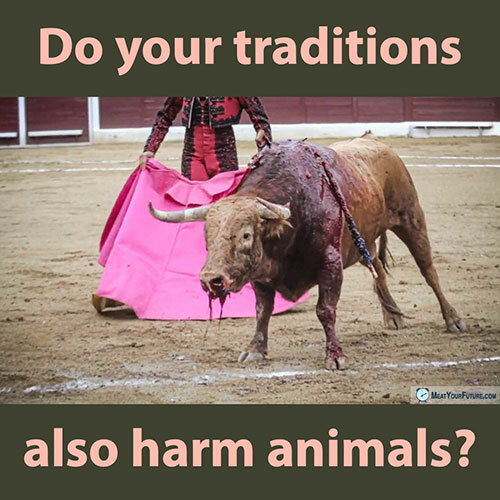 Do Your Traditionals Also Harm Animals? It’s easy to point fingers at other cultures and decry their animal exploitation. We see images of bullfighters torturing and killing animals, and it appalls us. We see other cultures catch and kill dogs to eat them, and it makes us upset. But how about also looking in a mirror and reflecting on whether *we* are abusing and needlessly killing animals? If we’re consuming and using animal products – including chicken, fishes, beef, bacon, eggs, dairy, leather, wool or otherwise – then indeed, we similarly are responsible for having animals tortured and killed on our behalf. By buying and consuming animal products, we directly pay for and support horrific mass cruelty, suffering and death imposed on countless billions of vulnerable animals. And, just like bullfighting, it is completely unnecessary. Some might say, but it’s a “tradition” to eat meat, it’s a “normal” to eat cheese, “everyone” eats bacon, etc. And while there might be important psychological differences between someone who bullfights versus someone who simply continues their socially-conditioned and normalized habits of eating and wearing animals, there is no moral difference — both involve harming and killing animals for trivial, unnecessary and easily avoidable purposes. We can easily live healthy happy lives on a vegan diet, filled with delicious and nutritious plant foods. And there is no important reason to use animals for fashion or entertainment either. Please make the connection. If you are against bullfighting and animal abuse, then you are already committed by your own current beliefs to also be vegan.